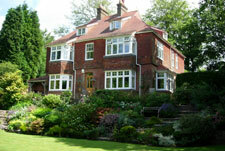 Mr. & Mrs. W live in a substantial detached house standing in its own grounds within the stockbroker belt in Surrey. Although their home comprised three reception rooms, kitchen, breakfast room and six bedrooms; they had a need for more accommodation. Their immediate options were to build a traditional extension at ground level or find a larger property in the immediate vicinity. Obtaining Planning Permission to build a traditional extension would have been difficult because there were many planning issues which had to be overcome. Furthermore a traditional extension would have significantly increased the footprint of the property and would not naturally integrate into the property’s existing layout. Costs for a traditional extension were estimated to be £350,000. Mr. & Mrs. W then investigated the possibility of moving home and viewed a number of suitable properties. Yet every time they returned they were glad to be home and would prefer to stay where they were. Expenses comprising Estate Agents fees, legal fees, removal costs and worst of all Stamp Duty were going to add £100,000 of irrecoverable costs to their purchase without any added value. Added to which the incremental cost of an alternative property was a further £1,000,000. Mr. & Mrs. W then considered a retro-fit basement and turned to Room Below. Firstly we provided a budget and then detailed structural designs and calculations. Twelve months later Mr. & Mrs W have a retro-fit basement of some 135 square metres comprising family room, home cinema, study, shower room and wc and storeroom. They estimate that the increase in the value of their property as a result of adding a retrofit basement substantially exceeds the cost of the works. In the words of Mr. W "Although the works took longer than expected they were completed to a high standard and were well worth the wait".